Stuck in Someone Else's Frame? I-Love-Cats.com proudly awards this cat site! Please upload your cat pictures, read cat articles or visit the cat forums! My name is Maxine Hellman and I live in New York City with my three cats. I love to travel and have touched foot on every continent. Nothing compares to traveling to new places and meeting and experiencing different cultures and their people. The memories of your trips will last a lifetime. Unfortunately, travel is no longer an option because I would not enjoy myself knowing that my pets were being boarded. I love animals and this home page is dedicated to my pets and their fur friends. I had a Pekingese named Cream Puff for 12-1/2 years before she left for the Bridge. Because I always have to have at least one pet in my life, I went to the Humane Society where I adopted a 10-month old male cat named Buck. Buck was born with neurological damage and a spinal deformity. Unfortunately, he was only with me one year before he joined Cream Puff at the Bridge. More about the Bridge and some of its residents later. The Loneliest Victim How Could You? Bannerama How Do You Say Kitty? Dealing With Stray Cats Are You A Cat Addict? From Your Cat Where Do Pets Come From? Bathing Your Cat What Is A Cat? Test Your Cat Vocabulary Can You Afford To Relocate? 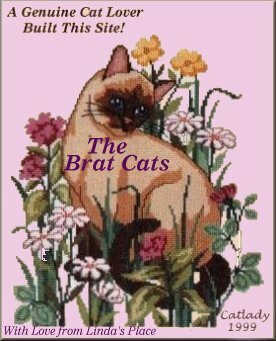 The BratCats are now Luke's Guardian Angel. Click on the plaque to learn how easy it is to become a Guardian Angel and help needy pets. Click on the banner below to see how "Kindness In Action For Animals" works and what you can do to help. Please be a responsible pet owner, SPAY or NEUTER!